The rattle-trap, red, Ford pick-up squealed out of the driveway Tuesday morning and something broken inside of it gave voice all the way to my husband’s work and back home again that night. He was kind enough to offer to help with dinner and the kids before buttoning up an old shirt and heading out to the garage to pop the hood. Before heading to bed, we decided he would call off work the next day to try to wrangle a repair. In the morning the older kids climbed into their yellow buses and the twins buckled into the van. John was going to drop them off at preschool before heading to the auto parts store. I headed out to the Little House to twiddle my thumbs as us artist types like to do, grateful to be excused from the thrice-weekly chore of drop-off. Out into the cold winter rain I went to turn the key. The van whined and moaned and finally I pumped the gas enough to give it a coughing start. I stood in the driveway and watched him pull out. We couldn’t leave the van running all morning and how would we pick up the twins if we couldn’t get it to start? I dread preschool drop-off because parents are instructed to pull-in under a carport where a teacher approaches, opens the door, and helps the kids out. Sounds simple, right? Except when your door handle's broken. Three times a week I cruise into the carport in our ancient burgundy minivan and lean back over the seats to pop the door open from the inside before whatever teacher happens to be on duty can make a fool out of herself wrestling the finicky handle. Three times a week I watch the twins climb out while silently hoping the teacher on duty won’t slide the door far enough open to cause it to latch. Most days they do. Then I’m stuck climbing over the seat again to unlatch the door and slide it shut. Wednesday, the day my husband stayed home and the vehicles went on strike, he didn’t know he needed to preemptively pop the door. Instead, he sat calmly in the driver seat while one of the boy’s teachers yanked and pulled on the handle, trying to get the door to shut. With a mighty yank, the handle broke right off in her hand. “I broke your handle,” she said passing what was left to my husband. The truck ended up being an easy fix and it appears the van was faking. In the end, I had more time to write and work than I would have otherwise. I will say that Wednesday morning I wanted to cry and nearly did when I couldn’t figure out how we’d get the twins back home. My mind bounced between righteous indignation, (This is Christmas! This sort of thing shouldn’t happen at Christmas!) and self-pity (Of course!). Making wreaths at the dining room table the following today, I thought about this thing we’ve got going on, this month-long season of Christmas in which we feel sorely offended if the world appears to be coming apart at the seams. We’re torn between demanding more - of the world, our children, ourselves - and a death-embracing resignation. Let me tell you what I know after wrangling evergreens and wire – it may be Christmas and you may want something more, but #$^% is gonna keep on keepin’ on. Red trucks will scream their way to work and back. Minivans will embarrass and fake their own deaths. Children will run wild through your house and you will be forced to play the “You’re father’s uncle died from falling down the stairs” card in a vain attempt to scare them straight. But rather than accepting the logical conclusion that one should not play on the stairs, they will blame the victim because everyone knows if you’re falling down the stairs you can stop yourself before you hit your head. You will accidentally step on the dog and scare the cat who will then claw the dog right on the nose and those two tiny drops of blood on that dear sweet nose will make you want to weep. But worst of all (or is it?) someone, somewhere will take a gun and shoot one or two or twenty and the seeds of evil that dwell hidden in the human heart will again seem to block out all rays of light. You will be tempted between control and resignation. You will want to throw your hands up in the air and walk away because someone somewhere has again ruined this yuletide season with their crimes and failures big and small. But then you will remember. We don’t celebrate Christmas because the world is perfect. We celebrate Christmas because the world is broken. It’s screaming to and from work, pulling apart at the seams, liable to break off in your very hands, broken. Advent is waiting with open hands, open hearts for the One who will sift through it all, cleansing, purging, until only what’s good, what’s pure and golden remains. Until then, we stand strong, we endure, we hang tinsel and plug in the lights because, for now, it may be as close as we can get to that for which our hearts so long. Thanks Kelly for reminding us that we live in an imperfect world with a Savior that loves and cares for us. Now I know why I felt compelled to pray for you on Wednesday. I, too, suffer from the illusion that there is "Christmas magic" out there that should keep mini-vans in working order and all the dog hair off the floor for the month of December. Thank you for speaking words of truth (with compassion) that bring reality and grace to this wonderful (but taxing) season of the year. it's still in the process of unfolding, but i woke up to a text with a photo of small-in-size, long-awaited, breath-holding beauty this morning from the other side of the world. And I will remember this wonder today. I'll blog about it sometime, but for now, I wait in wonder for more unfolding. "We don’t celebrate Christmas because the world is perfect. We celebrate Christmas because the world is broken." Thank you, Kelly, for reminding us. May God richly bless you and your family with the blessing of His fellowship! Exactly, exactly: "We don’t celebrate Christmas because the world is perfect. So many things go wrong each day, but even more things go right. 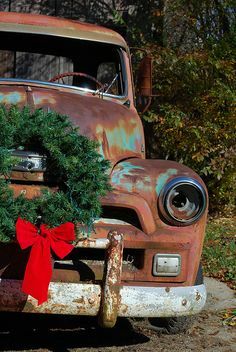 Hope your vehicles are both back in working order soon! I know how much those things make a difference in our daily attitudes. "We celebrate Christmas because the world is broken." I loved that. It's so true, and it reminded me of what Jesus said - that He came for those who knew they were sinners. For truly, it's only in realizing that we need to be rescued, that we can reach out for a Savior. Just love this! I had guilt for years thinking my son would be in therapy for all the broken car windows or doors I never fixed! Everything is broken, and yes, thank you Jesus for making it all right! I am often between "the poles of control and resignation" and also marvel at how demanding I can get that everything go as "hoped" during the Christmas season...letting go of my frustrations and expectations...surrendering to God's limitless LOVE! Thanks for the good words here to direct my heart back to His. Thank you for a prayer-inducing post, Kelly, as I, too, was struck by these words: "We don’t celebrate Christmas because the world is perfect. We celebrate Christmas because the world is broken." And I pray: Lord Jesus, thank you for coming into our broken world to offer us your perfection. Thank you for understanding that we dust-creatures (Psalm 103:14), unable to consistently make right choices. And thank you for your cleansing and purging, so that one day I will be refined as pure gold. Amen. Thank you for asking us to notice moments of wonder, sometimes hard to do if we turn on the evening news on any given day. Remembering there is still wonder and miracles to be found is salve to weary souls. Appreciate you and your honest writing. <3 Philippians 4:8 Finally, brothers and sisters, whatever is true, whatever is noble, whatever is right, whatever is pure, whatever is lovely, whatever is admirable--if anything is excellent or praiseworthy--think about such things.